I chose Cass because of its high ranking for my degree and its global reputation. An advantage of this University is having the diverse and fun city of London as your campus. After attending the Open Day, this University captivated me because of the facilities and modules offered. I wanted to study abroad and the options to do this were flexible as you can choose where to study, what to study and whether you spend a year or a term abroad. I always wanted to stay in London to study my degree because of the vast networking opportunities. Cass is ideal for this whereas my other universities were outside of London and did not offer as much adjustability with its study abroad choices. My favourite thing about studying at City is the opportunities and the support provided alongside them. 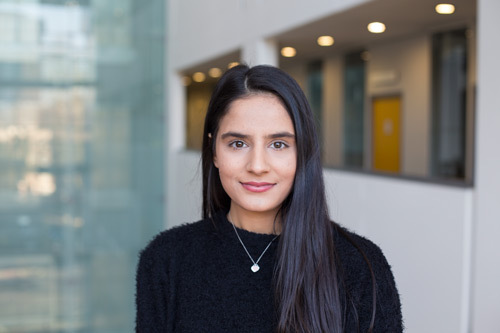 Studying Management at Cass is so diverse as there are an extensive amount of modules which we can choose from including Marketing, Management and Economics/Finance focused. There is also a lot of information provided about internships, work experience, studying abroad and clubs and societies. Have you had the opportunity to study abroad as part of your course? I had the opportunity to study abroad at Bocconi University in Milan, Italy. It was a great experience and enabled me to meet many people and travel around Italy but also learn a lot about the different ways of teaching and assessing in other parts of Europe. I chose to study abroad for a semester as I can still carry out a placement year if I want to. My experience studying abroad has also motivated me to want to work abroad and travel a lot with my career. My top tip to applicants would be to make sure they have researched their chosen degree thoroughly, through the website and Applicant Days, to ensure they will be studying a degree that they will enjoy and have fun learning about.